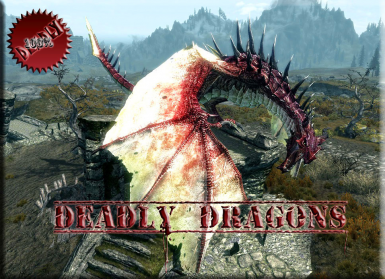 Deadly Dragons is the ultimate dragon overhaul mod for Skyrim. Customizable health & damage variables, new dragon types, and widely compatible. If you're looking for a mod that makes dragon encounters something to be truly remembered, then this is all you need. Reverted to original Assault Script to hopefully fix multiple dragons spawning. Resaved both esps in CK64. Changed and updated the dependency from USLEEP to USSEP. Fixed consistency between regular and loremonger versions. Added new spell, nDragonStats "Dragon Stats", to allow for easier compatibility patches when new dragons don’t have ability spells. Changed the Assault feature’s safe zone detection method so I can add the worldspace dungeons to the safe zones. The script nAssaultUpdQSTScrpt was modified for this. This also makes making compatibility patches easier as the new keyword just has to be added to the location. The new keyword is “LocTypeDDSafe”, adding this to a worldspace’s location adds the worldspace to the safe zone list. There is a separate plugin, that can easily be merged into the main esp, that makes the Hold capitals not included as safe zones by removing the added keyword. Added Deadly Dragon’s attributes to Dawnguard and Dragonborn dragons. Also added a frost variant of the Revered Dragon (DLC1EncDragon06Frost). DLC dragons have been added to related Levelled Lists and Form Lists. Removed duplicate dragons from Levelled Lists. Added Deadly Dragon attributes to dunLabyrinthianUndeadDragon. ﻿Deadly Dragons is a mod with a singular purpose; make dragons the feared & powerful creatures they supposedly are. If a single giant or small group of local bandits can take down an ancient dragon, why the hell does Skyrim need us to save it? ﻿By installing this mod you're agreeing to partake in epic, challenging, and intense battles with dragons. Dragons can and will provide you with a challenge where your strength, powers, and wits will decide if you triumph… Or forever be forgotten in the annals of the Elder Scrolls. Utilize every skill and item at your disposal to succeed in battle, and when it's over revel in the knowledge that YOU are the only one in Tamriel that can slay a dragon. ﻿In addition to Skyrims seven dragon types, fourteen new dragon types have been spread throughout the levelled list. From level 10 all the way up to level 65, the higher level you go the more impressive dragons will be. Every dragon type is different, some more powerful versions of the lower varieties. Each is different though, with their own attacks and their own appearance. If you do not want any new dragon types, there is a lore-friendly version available, called the "Loremonger Edition". This version allows you to use the full feature set of the mod, but without adding any new dragon types to your game and remaining completely lore friendly. In version 6.5.0 some frost and fire variants of existing dragons have been added. All Skyrim, Dawnguard, and Dragonborn dragons are now completely covered by Deadly Dragons. ﻿Through SkyUI's MCM menu, Deadly Dragons also allows you to customize just how difficult your experience will be. Want dragons with 50,000 health that deal more than four times the damage of Legendary Dragons? You can do that. Just want more health for longer fights? You can do that. Whatever your style, Deadly Dragons allows you to adjust health, melee damage, magic/breath damage, armor values, and resistances all independently of one another. No matter how ridiculously overpowered your Dragonborn is, Deadly Dragons can and will rise to the challenge. Make your changes and go dragon slaying, and adjust as needed. It's really that simple. ﻿All dragon breath attacks will now set the ground on fire or leave ice shards behind. Vanilla dragons have some extra abilities which can be disabled through “Special Skills” option. ﻿New Dragons are generally categorized as Frost, Fire, Shock, or Undead dragons. Fire, frost and shock dragons have 50% resistance to respective damage. Undead dragons have a 50% poison and disease resistance. Attributes – Change the amount of Health, Magicka, and Stamina dragons have. Melee Damage – Increase the melee damage dragons do. Armor Rating – Increases the armor rating of dragons. Magic Resist – Increases the resistance to Magic, Fire, Frost,and Shock damage of dragons. Magic Damage – Increases the amount of Magic, Fire, Frost,and Shock damage of dragons do. Difficulty – Sets the Custom Settings values to apre-defined amount. Stagger – Dragons become immune to Destruction magic’s ‘Impact’ perk. Shield bash & melee power attacks have only a 50% chance of staggering a dragon, instead of a guaranteed amount. Special Skills – Toggles added attacks/abilities of vanilla dragon types. Knockdown – Toggles whether dragons will knock the player down when they land on top of you. Combat behaviour – Three options to change dragon combat behaviour. No landing, Less Flying, and Default. spawning system. This timer is set by you and tethered to Skryim’s in-game timescale. You can set a base timer, select another value to be randomly added/subtracted from it, choose if you want one or several dragons to spawn. This is to allow you to have more dragons spawn in unexpected places where they normally wouldn't, and just to keep you on your toes. I personally recommend a value of several days (48-96 hours) with a 12/36 hour randomized setting. ﻿The ‘Safe zones’ toggle stops the Assault feature from spawning dragons in major hold capitals and some dungeons. An optional patch is provided to remove the hold capitals from this feature, allowing dragons to spawn in these cities and surrounding area. ﻿Deadly dragons also includes a handful of other options. Including configurable Dragon Souls-to-perk-points, adjustable world cell respawn time, and the option toggle important NPC's as "Essential". 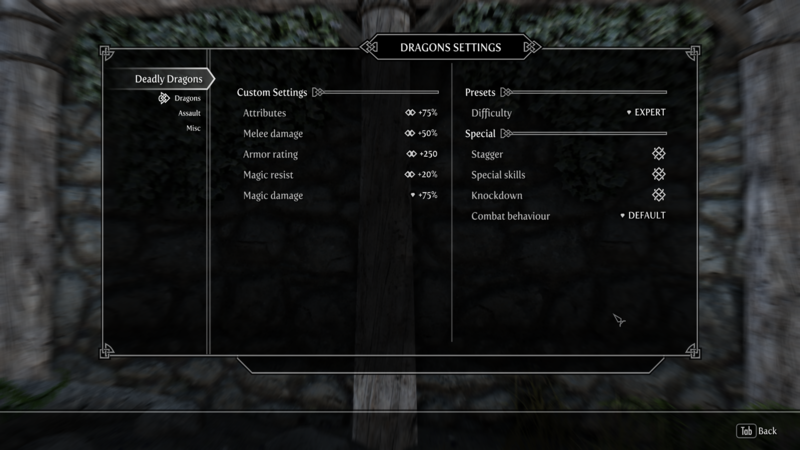 All of Deadly Dragons customization values default to the vanilla game settings. Use what you want and ignore what you don't. There are other mods that cover these features more fully, but if you just want the basic stuff it's there for you. NOTE: Assault dragons are spawned through scripting and not the standard spawning mechanic that Skyrim uses. Deadly Dragons does NOT change dragon spawn rates or locations in any way, shape, or form. Deadly Dragons does not break anything by its self, years of use and no major bugs have been reported. The fight with Miraak at the Summit of Apocrypha can be completed even with the Attributes setting set to 1000%. Deadly Dragons’ dragons are placed in levelled list and these will need to be carried forward to any Bashed/Merged/Smashed patches you create. The changes to vanilla dragons will also need to be carried forward if anything overwrites them. Deadly Dragons does not change dragon loot. Diverse Dragons Collection – Compatible by default. There is a patch to add Deadly Dragons stat settings to dragons from Diverse Dragons Collection, and also add Diverse Dragons Collection’s dragons to the Assault system spawn list. Splendor - Dragon Variants – Compatible by default. Deadly Dragons stat settings are inherited from vanilla dragons, so no patch needed for that. There is a patch to add Splendor dragons to the Assault System. Bellyaches New Dragon Species – Compatible by default. Deadly Dragons stat settings are inherited from vanilla dragons, so no patch needed for that. I might still make a patch to add the dragonsto the Assault System. Elemental Dragons – While its not really totally incompatible, dragons added by Elemental Dragons will not be affected by Deadly Dragons’ settings, nor will they spawn from the Assault system’s spawning. I might still make a patch to fix these things. KS Dragon Overhaul 1 – Does much the same as Deadly Dragons, use Deadly Dragons or KS Dragon Overhaul 1. KS Dragon Overhaul 2 – Does much the same as Deadly Dragons, use Deadly Dragons or KS Dragon Overhaul 2. Serio's Enhanced Dragons – Does much the same as Deadly Dragons, use Deadly Dragons or Serio's Enhanced Dragons. Enhanced Mighty Dragons and mods like it – Using Deadly Dragons and any mod like the former can result in virtually un-killable dragons, so they are not recommended. be alternative versions that do not require SKSE, USSEP or SkyUI. Nor will there be one-off versions without a particular dragon(s). Your Choices are standard, or lore-friendly. Step 1 – Download, activate, and organize with a mod manager of your choice. That is all. Once you're in game, you can customize your Deadly Dragons experience to your personal taste with SkyUI’s MCM menu. Keep in mind that these changes will not apply instantly. Any dragon that is still in your current cell (general immediate area) will not be affected, any dragons that spawn after adjusting your settings are altered will reflect those changes. to take a more immediate effect. Same goes for killing dragons that are on word walls. This is technically unnecessary, but if you want immediate effects it's the best way to do so. Main Towns Not Safe Zones – Removes the hold capitals from the Safe Zones feature, allowing dragons to spawn in these cities and surrounding area. Diverse Dragons Collection Patch – There are two version of this patch. Both add Deadly Dragons settings to the dragons from Diverse Dragons Collection. The standard version adds dragons from Diverse Dragons Collection to theregular version of Deadly Dragons’ Assault system, so vanilla Skyrim dragons and dragons from both Deadly Dragons and Diverse Dragons Collection will be spawned with the Assault system. The Loremonger version of this patch is for the Loremonger version of Deadly Dragons, and will add Diverse Dragons Collection’s dragons to the Assault system, so only vanilla Skyrim and Diverse Dragons Collection dragons will spawn with the Assault system. Splendor - Dragon Variants﻿ – Adds Splendor dragons to the Assault system. Wyrmstooth Patch – Adds a Wyrmstooth dungeon to the safe zones feature, and adds Deadly Dragons settings to the dragons from Wyrmstooth.